Lockheed, Northrop, Raytheon and General Dynamics are reaping record rewards for shareholders. NEW YORK — Led by Lockheed Martin, the biggest U.S. defense companies are trading at record prices as shareholders reap rewards from escalating military conflicts around the world. A Bloomberg gauge of the four largest Pentagon contractors – excluding Boeing, whose civilian airplanes business is larger than its military unit – rose 19 percent this year through yesterday, outstripping the 2.2 percent gain for the Standard & Poor’s 500 Industrials Index. Lockheed, the world’s biggest defense company, reached an all-time high of $180.74 on Sept. 19, when Northrop and Raytheon also set records. 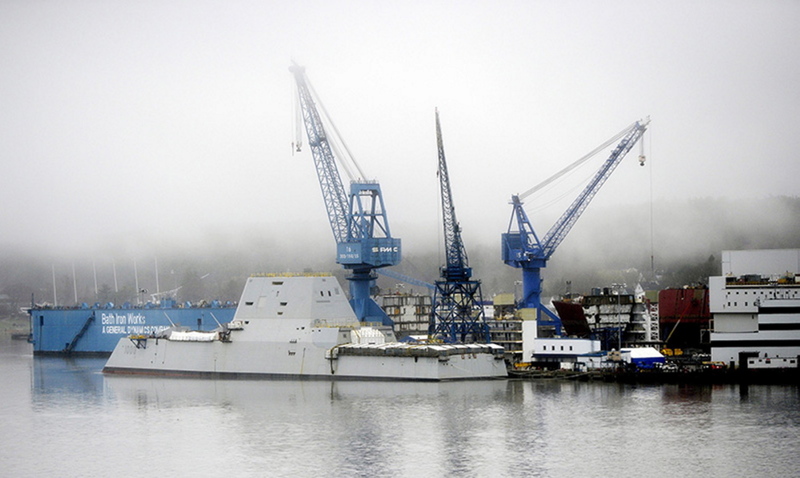 General Dynamics, the parent company of Maine shipbuilder Bath Iron Works, traded at $129.45 on that day, up from $87.74 a year ago. That quartet of companies and Chicago-based Boeing accounted for about $105 billion in federal contract orders last year, according to data compiled by Bloomberg. The Pentagon recently authorized Waltham, Massachusetts- based Raytheon to resume assembling warheads designed to intercept intercontinental ballistic missiles, a defense against threats from countries including North Korea and Iran. The program had been suspended in 2010 after failed test launches. Global conflicts are benefiting more than just the makers of offensive weapons, according to Rubel. He has a buy rating on DigitalGlobe Inc., a Longmont, Colorado-based company specializing in high-resolution satellite imagery that has supplied equipment used by NATO to monitor Russian movements along the Ukraine border. While the 2011 Budget Control Act mandated about $500 billion in cuts from proposed Pentagon spending over a decade, this year’s rally in arms stocks predates the emergence of the Islamic State in the U.S. public eye. In June, the group declared a caliphate and later released video showing the beheadings of U.S. journalist James Foley and other hostages. Pentagon contractors have been responding to the pullback in U.S. military budgets by shifting focus to international markets, said Philip Finnegan, director of corporate analysis at Teal Group, a Fairfax, Virginia-based consultant that tracks defense and aerospace companies. Even with revenue at Lockheed, Raytheon, General Dynamics and Falls Church, Virginia-based Northrop down 4 percent since 2011, non-U.S. sales have climbed 9 percent during that stretch. The four companies also have pared expenses, including reducing their combined workforce since 2011 by 23,000 people, or about 6 percent, according to data compiled by Bloomberg. The improvements to profitability, combined with investor- friendly moves such as stock buybacks, may influence share prices more than the strife in Iraq and Syria, Finnegan said. U.S. lawmakers including Rep. Peter King, R-N.Y., have suggested that the new global threats could prompt Congress to reconsider planned reductions in defense spending. “The military is stretched and stressed and there’s risk that if we cut much further, we’ll cut into serious bone and risk national security,” Rubel said. For the U.S. military, tensions between the North Atlantic Treaty Organization and Russia may force a rethinking of plans to reduce American deployments in Europe and postpone retirements of older fighter jets such as Lockheed’s F-16 and Boeing’s F/A 18, said Michel Merluzeau, an aerospace and defense consultant based in Kirkland, Washington. Russia’s annexation of Crimea and intervention in eastern Ukraine has spurred European governments to reassess defense strategies, too. Germany’s Krauss-Maffei Wegmann GmbH has reported new interest in its Leopard 2 tank, a peer of the U.S. M1 Abrams from Falls Church, Virginia-based General Dynamics. That would be a turnabout for European militaries, where armored units have dwindled in importance since the collapse of the Soviet Union more than 20 years ago. “We haven’t seen so many territories and borders called into question since World War II,” said BMO Private Bank’s Ablin.